• 100% cotton knit glove with 100% latex coating to help grip your stockings without tearing or ripping them. • Protects your compression stockings from your nails or jewelry. 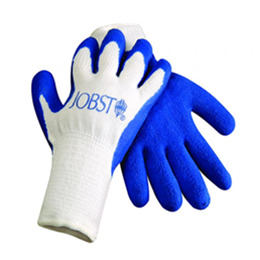 Jobst donning gloves provide a better grip in helping don your Jobst compression garments and socks. Donning gloves provide a better grip on your stockings and help protect them from punctures and runs that may be caused by finger nails or jewelry. 100% Cotton Gloves specially coated in blue latex for a best possible grip on your compression garments.